Kazutaka Kodaka (L) and Kotaro Uchikoshi. The writer-directors behind Zero Escape and Danganronpa have formed their own studio and are teaming up to create another game about school kids and murders. Fans of both series will likely want to check out Death March Club—especially since the developers don’t think their former employer will continue their old series without them. 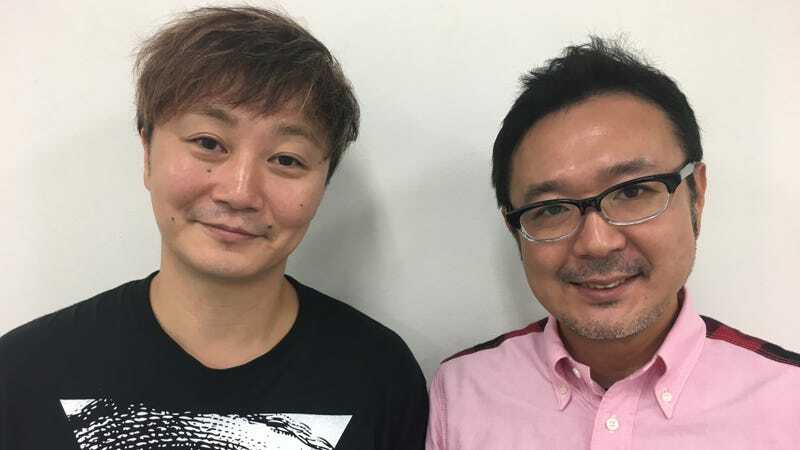 Danganronpa’s Kazutaka Kodaka and Zero Escape’s Kotaro Uchikoshi announced last month that they had departed publisher Spike Chunsoft and formed their own studio, Too Kyo Games. Today, the pair officially revealed their first game, Death March Club, which they plan to release in 2020. It follows a group of a dozen misfit school kids, each around 12 years old, who get into a car accident on a class trip, waking up to find themselves in an abandoned underwater amusement park where a clown forces them to play a Battle Royale-style murder game. Although the pair created similar games at Spike Chunsoft, they had never worked together before. “I always thought that Kodaka had things that I didn’t have, in a way that could be very complementary,” said Uchikoshi. “Also, Danganronpa fans tend to be more stylish,” said Uchikoshi, causing the room to break out in laughter. Currently, seven people work at Too Kyo Games, many of whom left Spike Chunsoft with Kodaka and Uchikoshi. The company will do game writing, direction, music, and art, but will work with outside developers for the programming. Death March Club’s engineering will be handled by the developer Grounding, under the supervision of Panzer Dragoon creator Yukio Futatsugi. Key art for Death March Club. “I selected people who can maintain their livelihood even if the company goes bankrupt,” he said. Other members of the company include those who created the graphics and music for Danganronpa. That’s why Kodaka and Uchikoshi don’t believe that Spike Chunsoft will continue with the series they started, because much of the talent behind it is now gone. “I typically forget the things I make,” said Kodaka.